Eliud Kipchoge’s epic gallop gripped the imagination of an entire nation. In every village and town, big and small, crowds assembled in expectation. He had tried and came short twice before. This time he was not to be denied. His spindly but sturdy legs carried the hopes of all his 40 million fans. The loose fitting, sweat drenched white T-Shirt hang loosely over his 5-foot 6 rugged frame, barely doing justice to his solid 57 kilos. Kipchoge had faced daunting tasks before as a small village boy relying on his single mother to keep the family going. The years of toil and pain needed one crowning moment that would establish him as one of the greatest marathoners of all time. The last born in a family of five would grow up without fatherly love. His father died when he was too young. He often relies on old photos and his three sisters and a brother for an idea of his father. Long before he became the subject of world sporting attention, he would do 30-km bicycle rides as a milk vendor for family upkeep. His mother would make bootleg to supplement the family income. All that tough past must have played at the back of his mind, with every stamp his Nike shoes made on the Berlin tarmac yesterday. After the breathtaking two hours, one minute and 39 seconds, smashing the previous record with a staggering 71 seconds, accolades started to flow in from all over the world. The New York Times described him as the greatest marathoner. Dennis Kimetto’s world record in a 2:01:39 also set in Berlin. This was the first official sub-2:02 display in the history of the marathon. The Olympic champion was the bookmakers favourite to wipe off Kimetto’s mark and he lived up to the billing in a warm Sunday morning in the German capital, which has now become famous for its favourably flat course. The last world record set outside Berlin was in London by Morocco-born American Khalid Khannouchi in 2002 in 2:05:38. Since then, Paul Tergat (2:04:55 in 2003), Ethiopia’s Haile Gebrselassie (2:04:26 in 2007 and 2:03:59 in 2008), Patrick Makau (2:03:38 in 2011), Wilson Kipsang (2:03:23 in 2013) and Kimetto (2:02:57 in 2014), have all done it in Berlin. Yesterday’s victory in which he virtually run alone was his 10th in 11 races, only falling second to compatriot Kipsang at the 2013 Berlin Marathon. Kipchoge’s focus showed from the gun as he, alongside pacemaker, Sammy Kitwara, Josphat Boit and Noah Kipkemoi, raced to the front, leaving Kipsang’, who had also entertained the desire to claim the world mark again in his wake. The gap grew bigger with every kilometre. Most of the race, he covered a kilometre between 2:49 and 2:58. However, Kitwara and Kipkemboi dropped earlier than expected. Boit had to do the heavy lifting. His performance took Kipchoge to around the 30km mark. Then he peeled off. He led birthday boy Amos Kipruto, a Berlin debutant, and Kipsang in a 1-2-3 finish in respective times of 2:06:23 and 2:06:48. “I lack words to describe this day,” said Kipchoge. “I am really grateful, happy to smash the world record. They say you can miss it twice but not a third time. So I want to thank everyone who has helped me,” added Kipchoge, who had won in Berlin in 2015 and 2017. I am just so incredibly happy to have finally run the world record as I never stopped having belief in myself. Running a sub two hours two minutes was simply amazing and I believe I can still go below that with such good conditions,” he added. Defending champion Gladys Cherono scored a hat trick of titles in the German capital as she won her third in four attempts to defend her crown in a course record time of 2:18:11. She was followed by Ethiopian duo of Ruti Aga and pre-race favourite Tirunesh Dibaba who timed 2:18:34 and 2:18:55. The Kenya double delight sent shock waves back at home with President Uhuru Kenyatta leading congratulatory messages to the winners. 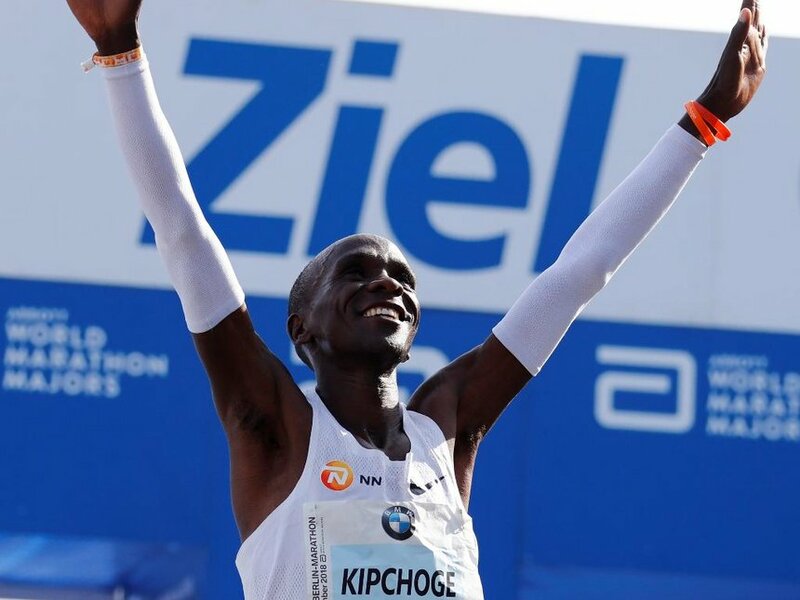 “Congratulations Eliud Kipchoge for breaking the world record at the Berlin Marathon 2018. I also congratulate his compatriots Amos Kipruto & Wilson Kipsang for going out valiantly to bring a 1-2-3 victory for #TeamKenya. You are our heroes. Kenya is proud of you. On behalf of an adoring nation and my Government, I congratulate you all for going out valiantly to bring a sterling victory for Kenya in the Marathon. You are our heroes. You have once again done our nation proud. Hongera. “Am thrilled by what Kipchoge and his colleagues have done to showcase our country’s ability in sports. My Government will do everything within its powers to support all those talented in sports to achieve their dream,” the President tweeted. Congratulations also came in from Deputy President William Ruto, Nasa leader Raila Odinga, US Ambassador Robert Godec, businessman Chris Kirubi, Central Bank of Kenya Governor Patrick Njoroge. Machakos governor Alfred Mutua in his excitement congratulated veteran athlete Kipchoge Keino who has long retired. There were celebrations in Uasin Gishu, Nandi and Elgeyo Marakwet as fans thronged entertainment joints to watch every step of the world record feat. Rigorous training for at least three months has been attributed to the spectacular win and world record breaking. In the build up to the Sunday run, Kipchoge had selected a team of top notch pacemakers.